It’s no secret that Disney vacations can be expensive. However, with proper budgeting you can manage those expenses throughout the trip planning process. This includes an honest assessment of all the budget categories you need to consider. 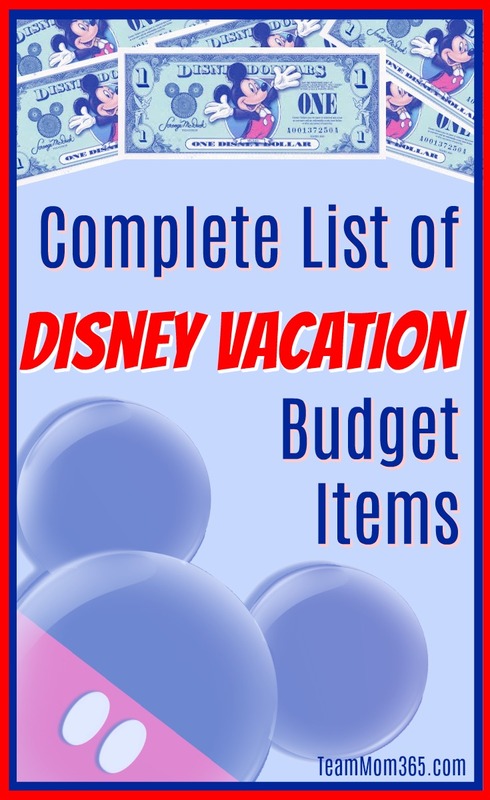 Remember, there’s more to budgeting for a Disney vacation than airfare, accommodations and food. 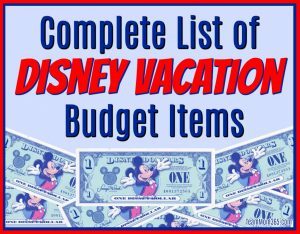 To make sure you have an accurate budget, there are three phases of your Disney vacation you should consider when making your vacation budgets. These are items you will have to pay for prior to leaving for your vacation. That means you will need to make room for them in your finances well before your vacation. This will include anything up to the day before your departure. These items will require you to have cash, traveler’s checks, or room on your credit cards or debit cards to pay for while traveling to and during your vacation. These items will be due at the conclusion of your vacation. That means you need to be diligent about your money while on vacation so you have the money to pay for them. This time period starts on departure day. Accommodations – There are several categories of accommodations which require pre-payment. This includes the resort hotels on Walt Disney World property, off-site condos and prepaid hotels. Don’t forget to include an resort fees which some off-property charge. Electronic Wheelchair Rental / Stroller Rental – If any members of your traveling party have mobility issues, an electronic wheelchair is the best money you will ever spend. There is a savings to pre-paying for these items. Food – There are some meals on Disney property which require pre-payment such as Cinderella’s Royal Table. Garden Grocer – This service delivers food to your resort hotel room. The minimum charge is $40.00 and the delivery fee is $14.00. Passport – A passport will be necessary if you are traveling internationally. It will also be highly recommended for Disney Cruise voyages. Theme Park Tickets – Sure, you could wait to purchase your park tickets but by pre-purchasing you will have the ability to make your FastPass+ selections at the 60- or 30-day mark. Transportation – This includes airfare or pre-paid rental cars. You should also consider any expenses related to driving to Disney such as car maintenance (ie. oil changes) and snacks for the drive. If you are flying, don’t forget to factor in baggage fees. Travel Insurance – This is one of those areas you can budget for the unexpected. It’s much better to have your travel insurance cover the unforeseen than to use your spending cash. VIP Tours / Special Events / Theme Park Extras – VIP Tours and tickets for special events such as Mickey’s Not-So-Scary Halloween Party are pre-paid items. Theme park extras like Memory Maker can be a hit to the budget when not planned for. Bank Fees – There are two bank fees to be concerned about when planning your vacation. The first is any foreign currency exchange fee. These are the fees you have to pay to exchange your home currency to the US dollar. The next fee is foreign ATM fees. Don’t take these fees lightly. They can be as much as $7.50 per transaction. Food – This will include all foods purchased at Disney either in restaurants or snack. If you are staying off-property make sure to budget for any groceries you will need for your condo. Souvenirs – This includes souvenirs for the adults and the kiddos. Electronic Wheelchair Rental / Stroller Rental – If you didn’t pre-pay for this Disney does offer on-property rentals on a first-come, first-served basis. Parking – If you are staying off-property, you will have to pay to park on-property. Tips – Having cash on-hand for tips is highly recommended. This is perfect for things like Skycaps and Mousekeeping. Make sure to budget for your round-trip. Transportation – If you aren’t flying you will need money for tolls, gas and snacks (if you didn’t pack any) along your journey. Airport Parking – This will likely be due at the conclusion of your trip. Accommodations – If you are staying at a traditional hotel, your credit card will be charge at check-out or cash will be due at that time. Rental Car – If not pre-paid, your fee will be due when you return the car. House sitters – Typically paid in cash, this will be paid at or shortly after returning home. Pet sitter or kennel – Unfortunately, they likely won’t give you your animal back until they pay you. Phone Charges – While this might not be a budget item many consider when planning a vacation, you should take into consideration any roaming charges your carrier charges. This is especially true for those traveling internationally. Room Charges – If you think you will charge anything to your room it’s always good to cushion your budget by accounting for this. Creating a budget is WAY easier than sticking to it. Here are some ways to make sure you stay within the budget you set. Divide your spending cash by the number of days you are at Disney and put each amount into a separate envelope and place them in your room safe. Before arriving at Disney, check the menus of the restaurants you plan to experience. This will give you a good idea of what your food budget should consist of. Don’t forget to add tax and tip to the prices. If possible, go to one of the gift shops located along US 192 (W. Irlo Bronson Hwy.) These shops are much less expensive. Leave extra room in your suitcase to bring extras back home. This could save you up to $100, depending on the airline, in overweight fees. Use your bank’s mobile banking app or a budgeting app to keep track of your expenditures. If you are vacationing with kiddos, give them a souvenir budget. This will discourage them from buying frivolously and save their allowance for something they really want and will enjoy well after your vacation is over. Use cash, travelers checks and debit cards when possible. This will reduce the amount of interest you might pay by using credit cards. Plan for the unexpected. Things like leaving early for the airport might seem like small beans but imagine if there’s an accident on the major highway leading to your airport. Airline change fees are crazy expensive. Also remember to have your insurance card handy or buy travel insurance to cover the cost of unforeseen disasters. Plan a down day – Any day spent at your resort enjoying the resort amenities is cheaper than a day in the parks. Budgeting for Disney is a sport in its own right! I always buy trip insurance which sometimes seems like a waste but I have had a health scare cancel a trip before and believe me it is worth it. I like that budgeting sheet. Its a good one! Thank you! And you are right, there are so many crazy nuances to a Disney vacation which can be forgotten. 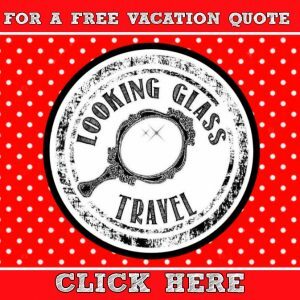 « Quiz: Which Disney Resort Should You Stay At?